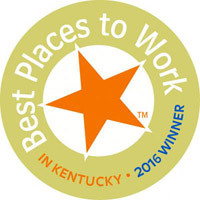 Middleton Reutlinger has recently been named one of the 2016 Best Places to Work in Kentucky in the small-sized employer category (those employing 15-149 U.S. employees). The announcement comes from the Kentucky Chamber of Commerce and the Kentucky Society for Human Resource Management (KYSHRM) and presented by Kentucky Career Center and the State Information Data Exchange System (UI SIDES). The winner rankings will be announced at an awards dinner Wednesday, April 20, 2016, at Heritage Hall in the Lexington Convention Center. Winners from across the state have been selected in three categories: small companies of 15-149 employees, medium companies of 150-499 employees and large companies consisting of more than 500 employees (categories based on number of U.S. employees, only Kentucky employees surveyed).